Several employees of a Middle River restaurant turned to Maryland Lottery games last week to blow off steam after a long shift. Among them was lucky Jeffrey Stone of Aberdeen. The waiter and his co-workers each picked out scratch-offs from a nearby instant ticket vending machine in hopes to win enough to buy one or two more games. They all won a little, Jeffrey said. He won a lot. Jeffrey’s found him at the Crazy Tuna Bar & Grille at 203 Nanticoke Road in Essex. 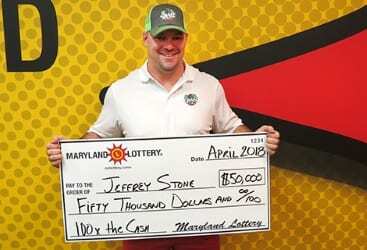 His ticket of choice, 100x the Cash, has revealed four of its six $1 million top prizes. Two more $50,000 prizes – the very one that ended Jeffrey’s long day with a flourish last week – remain available.